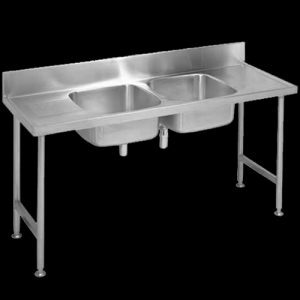 Double bowl catering sink (Franke model “S2” ), bowl positioned at the end or center (please specify when placing orders or requesting quotes). Catering sink is manufactured from grade 304 stainless steel 1,2 mm thick with a 150 mm high integral splash back to the rear and 50 x 10 mm turn down with a beaded edge on the remaining sides. Sinks come with pressed 500 x 500 x 230 mm deep bowls with 40 mm waste outlets. The underside of the double bowl catering sink is sprayed with vermin proof bitumastic sound deadening and supported with a 30 x 30 x 3 mm framework and galvanized mild steel backing sheet. 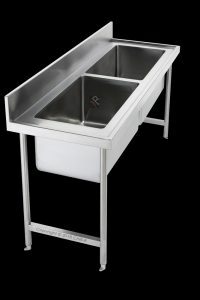 The double bowl catering sink unit can be fixed 900 mm high from the top of the front apron to the finish floor level with anchor bolts (bolts specified elsewhere). The catering sinks can be used as freestanding units with either round or square legs or they can be fixed to a wall with gallows brackets which come with a detachable front leg. These units can also be supplied without any fixing options, to be used as drop-on units mounted on top of cabinets.Please refer to fixing table for fixing options. 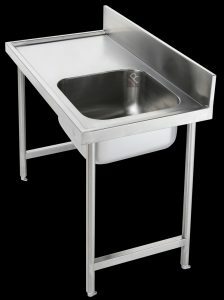 Side view of the catering sink. Note the height of the work surface is 900 mm. With the splash back it is 1050 mm.